After flying in and picking up a rental car, many island visitors must return to the airport to pick up additional friends or family who arrive on later flights. But where should drivers wait for those passengers? Leaving an idling car at the doors of the terminal is not permitted. Driving around the terminal is stressful, adds to airport congestion as well as being a gas-waster. 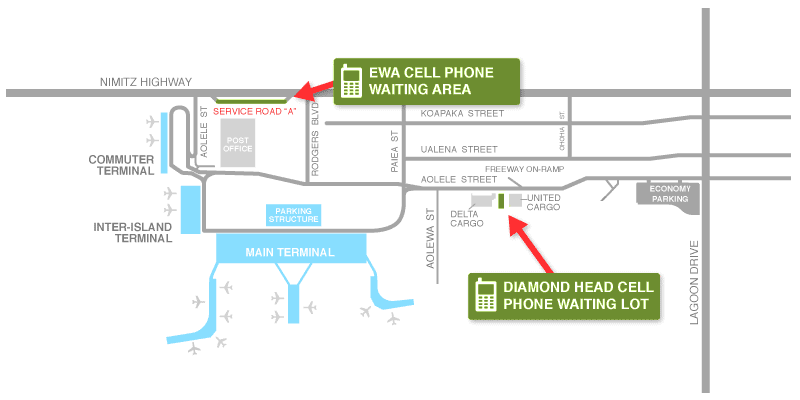 The unknowns of waiting for guests are eliminated when you drive into one of the two free Cell Phone Lots provided at Honolulu International Airport (HNL). Simply remain in the parking lot until your passengers call you to let you know they've arrived. You may enjoy two or three update-calls with them while you comfortably wait in your air-conditioned rental vehicle, away from traffic and noise. Note that you may park here for up to an hour, and you must stay with your rental car. Once your guests arrive at Baggage Claim, have retrieved their luggage and are heading outside, you can simply leave the Cell Phone Lot and drive to either the Diamond Head or EWA Baggage Claim exits, load them in the rental car, and be on your way to sun and fun.